Is there a limit to the number of plates that I can purchase? No,there is no limit but there is a minimum purchase of 25 plates to get the $5.00 cost. Can an individual purchase the plates outside of the school/organization? Can I purchase a single license plate? Yes, the cost is $20.00 plus $3.00 shipping per plate. Looking For A Simple High Profit Fundraiser? With USA Wrestling's License Plate Fundraising Program, your organization or wrestler can benefit with a profit margin of almost 75%. A. When it helps fund your wrestling program! 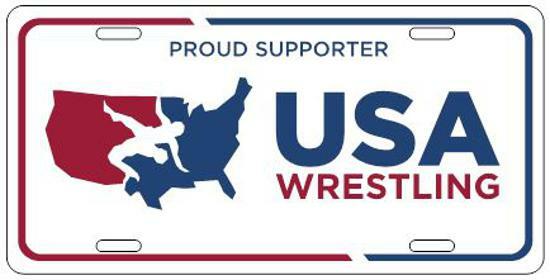 USA Wrestling is offering license plates like the one pictured here for $5 each plus shipping and handling for resale at $20 by your wrestlers. The profits are kept in your program to support your wrestlers and wrestling programs. These are real license plates true in size and material and ready to mount on the front of a car (where allowed by law), display in an office, bedroom or dorm or just give as a gift. A minimum purchase of 25 plates is required. There is no pre-ordering or advance collecting by the athletes. Just order the number of plates that you want and we will send them to you for only $5.00 each plus shipping. As soon as you receive the plates, you can start raising money.